GRUS (Group Decision Support System, GRoUp Support) is a Web-based system supporting collective decision processes that take into account the individual preferences of different actors from a same organization. It’s about supporting a multi-criteria approach for solving a concrete problem, in which decision makers must agree on a concrete alternative of solution based in the balance among all of the individual preferences. The system has been used in diverse scenarios in various domains, but not in agriculture. A particularity within the world of agriculture is that there are still places with a lack of technological support, that may help the farmers to evaluate and explore alternative solutions. In this regard, Wilken et al [Wil90], mention that in Central America and Mexico during the ‘90, there were traditional systems, mainly depending on local group experience-based knowledge that is transferred verbally from one generation to other. We observed that this mechanisms still perseveres in some farms of small or medium size in south america, Argentina in particular . There is still an informality in decision-making, and we would like to know if a system assisting users in the decision process is really helpful for farmers, e.g. if they found that using a system allows them to visualize more alternatives of solution, or if their confidence changes when taking decisions by explicitly entering each criterion and its related weight. But before contrasting the use of a system against the conventional methodologies, it is essential to evaluate if the current system, designed to support general-purpose decision making, adapts well to the knowledge and specific needs of farmers. A possible way to do this is conductions a concept demonstration script session with the farmers. in this regard, Sutcliffe & Ryan [Sut98] mention that one of the techniques of the SCRAM method for requirements elicitation and validation is providing a designed artefact which users can react to. To do so, prototypes or concept demonstrators can be used. In fact, the authors present a case study where prototypes were developed but had limited functionality, so they choose to run the demonstration as a concept demonstrator script. Røkke et al. [Røk10] also present a work where a combination of prototypes and demonstrator sessions are used to elicit and validate the early acceptance of the stakeholders’ requirements, in the context of a the User Interface Development for the Oil and Gas Industry. Now, the next steps will be to carefully choose the questions that will be asked after each of the steps shown in the video, in order to collect some feedback from the farmers. The experience with the real farmers is planned for October 2018. This entry was posted in disemination, tools and tagged grus. The European Conference on Operational Research (Euro 2018) took place from July 8th to 11th in Valencia Spain. In the context of this conference, RUC-APS organized three special sessions. 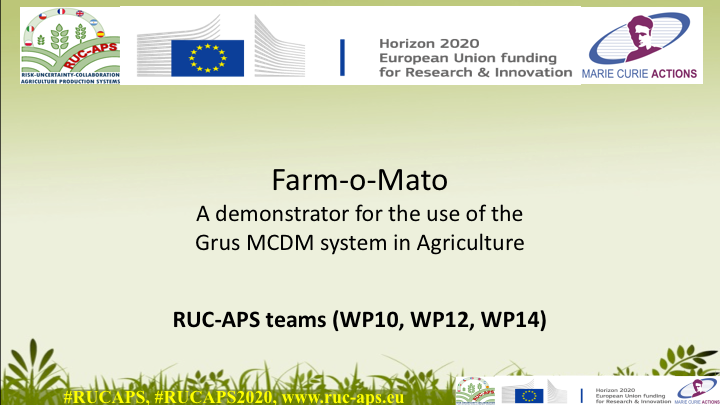 In total, 12 articles were presented, some of which were submitted by researchers in the RUC-APS consortium. The detailed program is provided below. 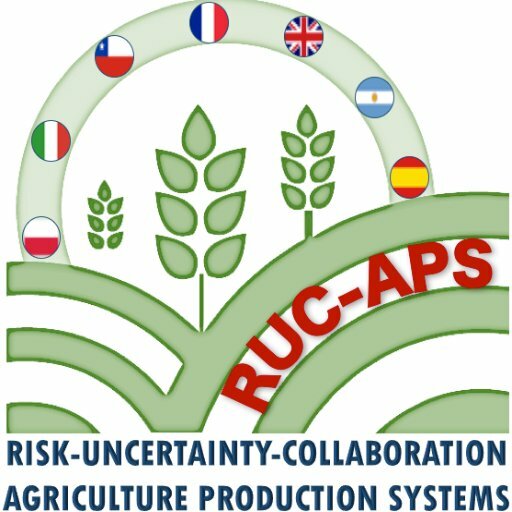 This sessions contributed to the consolidation and expansión of the RUC-APS network, towards risk and uncertainty in agriculture and agri-food systems. This entry was posted in disemination, updates.